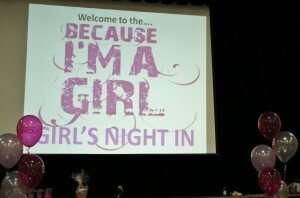 Being a new member of the ‘Because I Am a Girl’ speaking Bureau, I was a guest and spoke at a ‘Girls Night In’ event hosted by the Ottawa Jewish Community school. It was surreal for me. 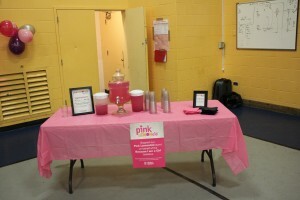 As I walked into their gymnasium that was decked out in pink streamers, pink balloons and pink table cloths I got an immediate sense of ‘community’. 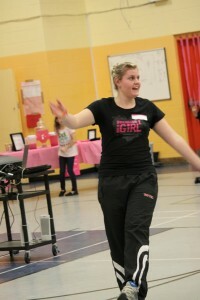 The teachers were super friendly and girls were running around in the pink t-shirts full of excitement. In total there were around 40 girls grades 4-6 PLUS their moms or grandmothers, sisters and aunts.I wasn’t allowed to take any pictures of the kids but I hope you can get a little sense of what it was like by these photos. 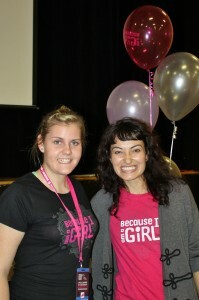 My Supervisor Lindsay Higgs flew in from Toronto to come and speak to the girls about gender equality, having a voice and how important education is. 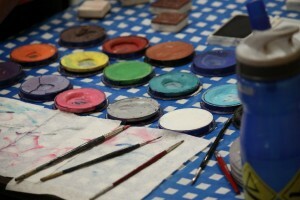 This event was organized by the school. 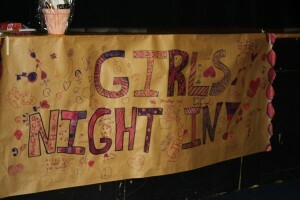 Anyone can host a ‘Girls Night in Pary’ and you can do whatever you want at the parties but obviously the purpose is to address some of the issues that girls face around the world in regards to human rights. 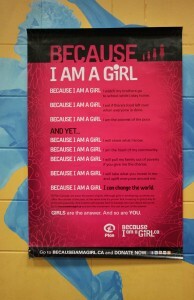 Did you know that over 75 million girls today are not able to be in school. I promise I will never complain about school again! 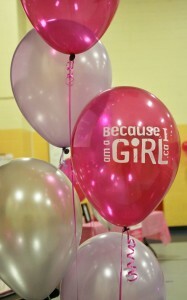 The night started with a group of girls from the school who created a Because I Am a Girl club at the school. It was really cute to see how proud they were and how much work they put into their presentation. 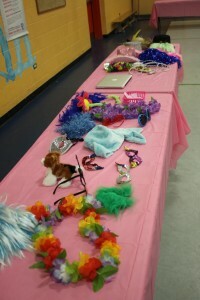 The girls were then divided into stations of making some beaded jewelry, face painting, a costume photo booth and creating inspirational book marks. The school was clever by including a donation of gently used books that were going to be delivered to a local safe house for teenage moms who are trying to finish their high school education. We all need to help each other and we can start by helping our own neighbours. We never have to look far to find someone who needs a helping hand. It was a good chance for me to talk to the girls while we were working at the stations so I could get a sense of who they are and I could mold my presentation a little bit better for them. I soon found out how intelligent these girls were. They were very kind to me helping me with my crafts and costumes. There was another guest speaker who came in and showed her videos of extreme marathons that she has completed all around the world. I found it super cool and it inspired me to do something like that some day. It amazes me how many unique challenges, races and opportunities that are available all around the world but you don’t often hear about them. Then it was my turn. I felt completely comfortable in this environment and I was looking forward to it. My biggest problem was I had so much information and so little time. 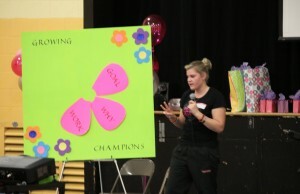 My objective was ‘Because I am a Girl’ I wanted to help these 40 younger girls make a goal and give them my 5 tips that I use whenever I set a goal. 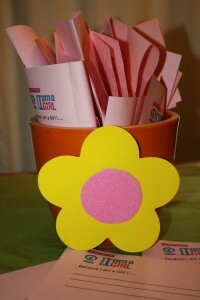 Together we wrote them down on (pink) paper and put them into a big goal pot. That way, together we can all achieve our goals together and we all did step one as a group. Together we are Growing Champions. We need to grow as many champions as possible since being a champion gives you confidence to help and make a difference for others. Being a champion gives you the confidence to have a voice. It was really interesting hearing the different definitions of what a Champion is. We talked about how champions help others to become champions too. A medal around your neck does not define someone as a champion. It’s the character building through the journey that makes you a champion! We put all our goals in our ‘goal’ pot and hopefully by being kind, supportive and helpful to each other we can all reach our goals. The more confident, generous and strong girls we create, the more we can help our own communities and communities around the world. Pot of Growing Champions. Watch us Grow! As the girls were enjoying their bed time snack of ice cream sundaes I sang a song I wrote last week since the words were very appropriate to the event. 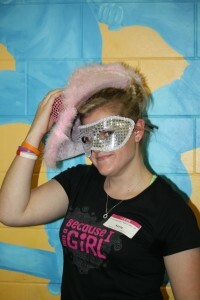 Earlier in the night, there was another teacher who said a few words about mitzvahs, and giving back to the community. 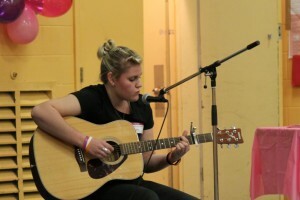 She also played a song that all the girls were singing along with so I knew they liked music. They seemed to all like my song too so I was happy. The highlight of the evening for me were all the little conversations I had with the girls and their moms after the presentation. I was touched by their comments, their goals and how they wanted to keep in touch and follow my blog. I was supposed to be inspiring to them but I think I was more inspired by these young girls. When I got home I read every single ‘goal’ sheet and I was so impressed with everyone’s goals and the mentality these girls have! 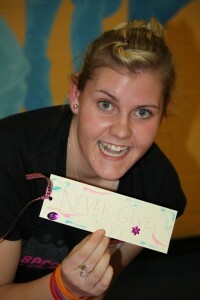 What pleased me most was that I could tell the girls got my message by the way they filled out their goal sheets. If I can make a difference in just one of these girls lives that would be awesome. 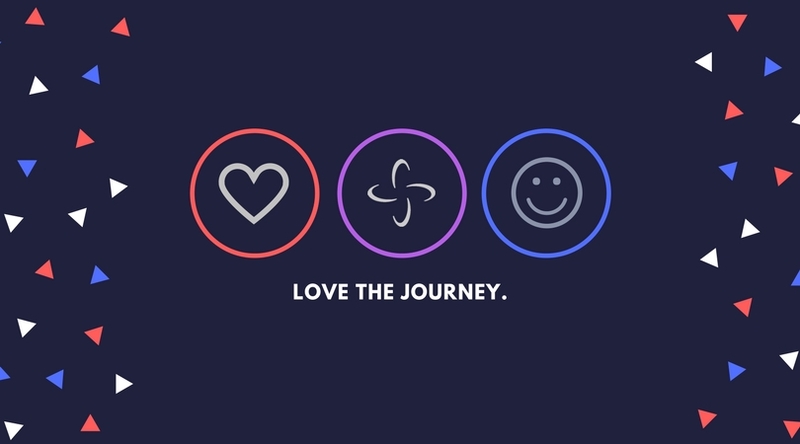 I hope to hear from them along THEIR journey. I left the night with three people asking me to come speak at another school, someones company, and I was invited back to this school for a longer session. I would say the night was a HUGE success. Congratulations everyone on a job well done.